Jossey-Bass and PCG Education are proud to bring the Paths to College and Career English Language Arts (ELA) curriculum and professional development resources for grades 612 to educators across the country. Originally developed for EngageNY and written with a focus on the shifts in instructional practice and student experiences the standards require, Paths to College and Career includes daily lesson plans, guiding questions, recommended texts, scaffolding strategies and other classroom resources. 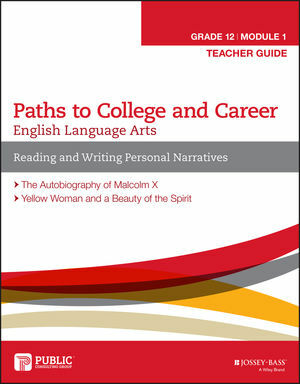 Paths to College and Career is a concrete and practical ELA instructional program that engages students with compelling and complex texts. At each grade level, Paths to College and Career delivers a yearlong curriculum that develops all students' ability to read closely and engage in text-based discussions, build evidence-based claims and arguments, conduct research and write from sources, and expand their academic vocabulary. Paths to College and Career's instructional resources address the needs of all learners, including students with disabilities, English language learners, and gifted and talented students. This enhanced curriculum provides teachers with freshly designed Teacher Guides that make the curriculum more accessible and flexible, a Teacher Resource Book for each module that includes all of the materials educators need to manage instruction, and Student Journals that give students learning tools for each module and a single place to organize and document their learning. Nationally recognized professional development from an organization that has been immersed in the new standards since their inception. Blended learning experiences for teachers and leaders that enrich and extend the learning. A train-the-trainer program that builds capacity and provides resources and individual support for embedded leaders and coaches. Paths offers schools and districts a unique approach to ensuring college and career readiness for all students, providing state-of-the-art curriculum and state-of-the-art implementation.